The Simple Search finds exact matches in the Title or Notes fields of records (see Search Type AnyWord). Multiple words are linked together by AND unless using quotation marks. Filters are used in conjunction with the search terms to refine the search. Archival Records - filters results for records that are available in the Archives (Archival Boxes, Folders, Photos, Maps), excluding Council Documents. Archival Photos - filters results for Archival Photos and Archival Photo Folders. Council Documents - filters results for records associated with the Portland City Council including, ordinances, resolutions, minutes, agendas, session minutes, and audio. The Advanced search form lets you combine two or more search types. Some search types are pre-selected: Any Word, Record Date, Document Content. Click the search type to choose a different option from the drop-down menu. 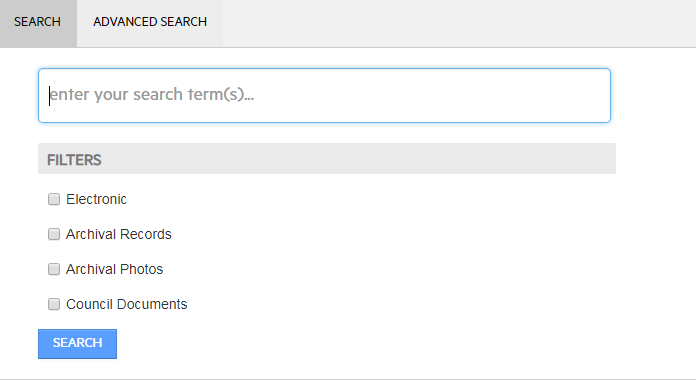 For any search type you would like to use, type the terms you wish to include in the search in the equal to text box. Record Date - Sorts by Record Date, oldest to newest. See Search Types (Record Date) to see how to add a date range to Efiles searches. Use this search anywhere on Efiles to run a simple Title Word search. To save a search: perform the search and bookmark it in your browser. When you open bookmark the search it will re-run the search and find any new matches.